When It's a Tat, It's an Honor! I recently got a sweet "tweet" (a Twitter message, for the non-online socialites) from a happy former client wanting to show off something really rather flattering for any creative who does this for a living. 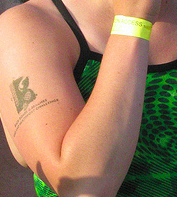 It appears that the identity I fashioned for them has moved into the highest level of wearables–the temporary tatoo! "Check this out Steve: http://www.flickr.com/photos/loraincounty/ We have people calling to wear logo now!" Now how cool and RDQLUS is that? !